Watching the first three games of the Islanders-Pens series has been an emotional roller coaster for fans. After game 1, when the Pens absolutely dominated the Islanders, Pens fans were ready to start engraving names on Lord Stanley’s cup. Just 48 hours later, by the end of the game 2, where we blew a lead and lost at home to those same Islanders, some folks were ready to march on Consol with pitchforks and torches in hand looking Fleury, Bylsma and essentially any other Pens player not named Sidney Crosby. The roller coaster that was games 1 and 2 had nothing on game 3. A few minutes into game 3, with the Pens down by 2 goals and a raucous Islanders home crowd pouring salt on our fan wounds with every FLEEEEEUUURRRYYYY, I thought it was time for the Pittsburgh Police Department to shut down access to any and all bridges in the greater Pittsburgh metro area. After the Pens scored 4 unanswered goals, however, all seemed right in the world – the birds were chirping, the sun was shining, and we were back on track. Two goals by the Islanders in the 3rd to tie it and suddenly we were back to manning the bridges. 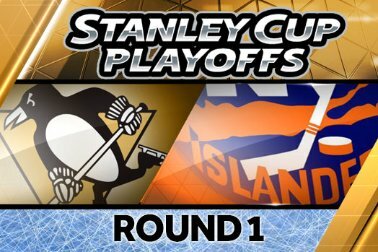 The roller coaster would take one last turn – in our direction – off the puck of Chris Kunitz to give the Pens the win and a 2 to 1 series lead over the 8th seed Islanders. Three games into it, and we have experienced every emotion known to a fan. What we need to remind ourselves, however, is that the Stanley Cup playoffs are a marathon, not a sprint, so all of us (myself certainly included) need to calm the f!ck down. I know it is hard with the ghosts of playoffs past, particularly last year’s embarrassing exit in round 1 against the Flyers, looming large in our minds, but let’s calm down and enjoy the ride. We need to remember that 14 teams – including those hated Flyers – are busy making tee times rather than working on their power play. Just making the playoffs is something we can and should relish, if you don’t believe me, just ask those raucous Islanders fans how happy they were to finally have playoff hockey back in their dumpy arena. Obviously, the Pens are not the Islanders, and I am not suggesting that we should be happy with them just getting to the playoffs. But getting to the playoffs is the first step in actually hoisting another Stanley Cup. The next step will be winning 2 more games against the Islanders and moving on to the next round. The Stanley Cup playoffs aren’t like March Madness or the NFL playoffs, it’s not one and you’re done if you lose a game. Even the best teams will lose a few games along the way. This Penguins team is built to win a Stanley Cup. They were built to win one even before the additions of Iginla, Morrow, Murray and Jokinen. Nothing less than a Stanley Cup will be considered acceptable. I get that. But let’s enjoy the road to that Stanley Cup. There will be games we lose, games we win, games where our D looks terrible, games where our D looks great, games where Fleury looks like a sieve, games where Fleury looks like a shut down goalie, games where we will score 6 goals and games where we might not score a single goal. And maybe there will even be a game where Tyler Kennedy gets on the ice (ok, so maybe no one but me wants this to happen). It is all part of this beautiful road to the Stanley Cup. Fans will be fans, and we are going to get fired up, but let’s just remember that the playoffs are the proverbial second season of hockey: so keep calm, have fun, and Lets Go Pens!